This propane or natural gas powered portable campfire / fire pit is ideal for backyard campfires and barbeque areas as well as for your favorite camping spot. 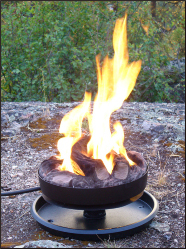 The Campfire-In-A-Can ® campfire can be set up in literally minutes, providing you with a clean burning, safe, authentic looking fire pit for the enjoyment of your family and friends. Enjoy the comfort and ambience of a campfire without the smoke or mess. The Campfire-In-A-Can ® can even be used during local burning or campfire bans in most jurisdictions! Instead of chopping wood for your traditional campfire, sit back and relax with the Campfire-In-A-Can ® portable campfire / fire pit. Includes: campfire burner with pedestal stand, 10 foot gas hose and regulator, cooking rack, one-piece true ceramic log set, black fire glass, Super Glow ceramic chips, multi-function lid/stand with folding carrying handle, and instruction manual.